Tammy and Gary Wilson, owners of Kid’s Country Barn in Hillsboro, prepare for their grand opening Oct. 5-6. 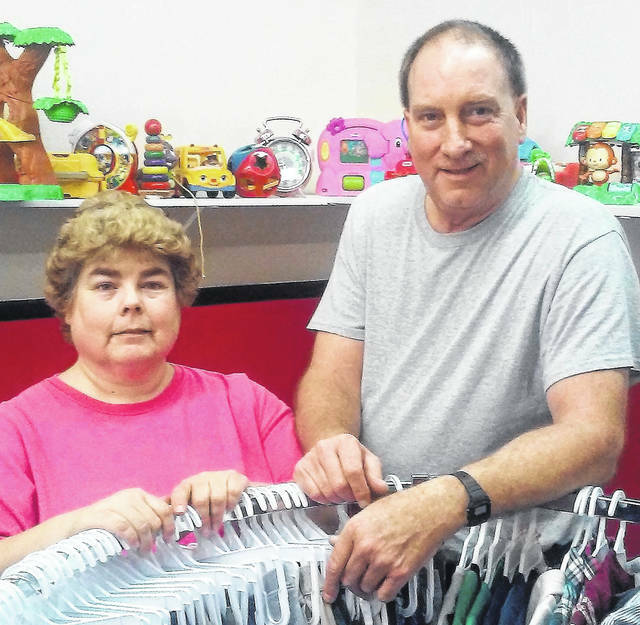 Tammy and Gary Wilson liked Hillsboro so much they decided to open a children’s clothing store, featuring clothing and other items from newborn to preteen. “About three years ago we bought a house out at the lake off of North Shore Drive, and then we began kicking around the idea of opening a small shop that had kids’ items,” Gary said. The couple lives in the Dayton suburb of Beavercreek and plan to eventually retire and downsize to their smaller home at Rocky Fork Lake. Kids Country Barn will be located at 145 Catherine St., on the corner of Catherine and North West streets in Hillsboro. The grand opening is set for Oct. 5-6. The grand opening will feature hot dogs, cookies and soft drinks for kids and their parents, in addition to guessing games as to the number of M & Ms and candy coins in a jar, and a coloring contest. They had originally planned to open their store back in January, but a family medical emergency put everything on hold. The Wilsons are quick to point out their store isn’t a consignment shop, but they do sell new and gently used items, and will also buy items from customers. The Wilson’s daughter, Crystal McKinley, will be the manager of Kids Country Barn. She and her husband Brandon live in Middletown and are in the process of finding a house and relocating to the Hillsboro area. https://www.timesgazette.com/wp-content/uploads/sites/33/2018/09/web1_Kids-country-barn.jpgTammy and Gary Wilson, owners of Kid’s Country Barn in Hillsboro, prepare for their grand opening Oct. 5-6.